A few years ago, I was interviewed by Madelyn Cohen Travis as part of her PhD study of Jews and Jewishness in British children’s literature. Why, she asked me, as a writer who is Jewish, did I not write about Jewish themes and characters? My answer was that my first two books concerned themselves with a boy in witness protection, struggling with his sense of self when taking on a new identity. Making him Jewish would have added huge complications to the plot, while distancing him from the experience of ordinary readers. I wanted teenagers to feel that this could happen to them, so it was important that he was an ‘ordinary’ boy - whatever that is. I was, however, quite happy to make him a Roman Catholic, and delighted in using Catholic concepts and imagery, although the underlying themes - running from danger, changing one's name, starting again, are really very Jewish. There were other reasons why I didn’t create Jewish characters. First, I very much didn’t want to be pigeon-holed in any way as a Jewish or even ethnic writer, as I consider myself equally British and Jewish. Second, there’s a very British Jewish thing about keeping one’s head down, not being ‘too Jewish’ which I had learned from a very early age. Third, I was well aware of anti-Semitic tropes. My third book is about a girl who wins a lot of money. I wasn’t going to put anything Jewish into a book like that, because the only overt anti-Semitism I had experienced in Britain, up until a few weeks ago, was based on the myth that Jewish are rich and mean. Thinking about it, though, I became aware that one day I wanted to write a book about British Jewish teenagers. Partly because, as Madelyn’s excellent research proved, there are almost no books being written today about British Jewish teens, and in the past many Jewish characters were offensive stereotypes. Even Beatrix Potter created a greedy starling called Ikey Shepster. If Jews appear in more recent British children's books generally they are victims (mainly historical) or villains (mainly Israeli). Or they are only vaguely Jewish (there's a boy called Goldstein in the Harry Potter who has no personality, let alone a Jewish identity). Or sometimes they are Jewish but completely secular and keen to prove it, a bit like Ed Miliband, munching his bacon sandwich. Of course there are many secular Jews, and many tangentially sort-of Jews in Britain. But the Jewish kids I know, the ones who go to synagogue at least occasionally, who might go to Jewish schools or youth groups, who know how to play Jewish Geography, who have friends called Rafi or Zak or Ariella: I never see them in books. I am passionate about diversity in YA literature. My books have characters who just happen to be Muslim, black and mixed race. I feel it is important to reflect the world I see around me, and to put the teenagers that I meet at schools into the books they read. Shazia, in my book Lia’s Guide to Winning the Lottery, is a Muslim girl inspired by some of the lovely girls I met at Elizabeth Garrett Anderson School in Islington, voracious readers with open minds and a lot to say for themselves. They deserve to see themselves in books, and it doesn't happen enough. One of the reasons that I am so passionate about this is that I almost never saw anyone like me in any book that I read when I was growing up. Antonia Forest’s Marlow family books were one shining exception, with a character Miranda West who was British and Jewish, who suffered from mild occasional anti-Semitism, and general ignorance about who she was and what she might believe, but mostly got on with life without her Jewishness getting in the way. Although Miranda was different from me in most ways, we had enough in common to make me feel less odd, different and invisible. So, I have just finished writing a book, entitled This is Not a Love Story. It is a book about falling in and out of love, with the problems, passion and anguish that can bring. It is set in Amsterdam, but two of the teenagers are Jewish and British, and I based them on kids that I know and love. My characters don't talk much about Israel and Palestine - hardly at all in fact. For Theo Israel is a central part of his identity, somewhere where he’s visited often on holiday and on youth group trips, somewhere where he has close family. For Kitty, it’s somewhere she hasn’t visited and doesn’t feel especially close to, partly because her mother thinks it has too much ‘negative energy.’ In some ways her distant relationship with Israel reflects her feeling of being an outsider in the Jewish community in London. . They only talk about this in passing, because I didn’t want the book to be swamped with earnest discussions about Zionism and I didn’t want readers to judge Theo and Kitty on the basis of their ideas about Israel and Zionism. One of the disquieting things about the last few weeks has been the feeling that one is judged as a ‘good’ or ‘bad’ Jew – by some people on how much you are prepared to condemn Israel, and by some other people on how much you are backing its government’s strategy. In private many of us have admitted feeling scared to say anything at all. I am scared to post this blog, I have to admit. My book is finished (pending editorial notes) and I am hoping that the world will become normal again, that our blundering leaders will find a way towards peace, and more than peace, find a way to happy lives, free from fear and oppression, not just for Israel and Palestine, but for all the many places in the world where people are dying and under threat of death. I hope that some of the frightening anti-Semitism I have witnessed recently signifies nothing more than ignorance. I hope that yet again my characters will become typical in not feeling very connected to world affairs, in their assumption that dangerous anti-Semitism mostly lives in the past. My book is only a very tiny part of any bigger picture. But my hope is that by writing about Jewish kids I can fight prejudice and stereotypes in my own small way. Well done Keren.I am also Jewish and never saw myself in books growing up in the fifties and sixties in this country. I was always the only Jewish child in school and pretty well everywhere else. I do hope that people read your post with the open mind that you have written it - whatever their political views - and I look forward to reading your book. I look forward to reading your book, Keren. But perhaps I was just a bit dopey! I was Sue, because like Miriam I was one of only a few Jewish kids at my school. I might have felt differently had I been part of a bigger Jewish community. Thanks - as someone who was usually the odd one out for other reasons I can associate with this. Whoops, I just commented as a cat - that wasn't intentional - it seems the cat is more internet-savvy than I am. Just wanted to say thank you for this honest and moving post, Keren. I can't wait to read your book. Excellent, thoughtful post, Keren. Thank you. Btw, the reason I deleted the comment is because it appeared twice, not because I changed my mind about anything! Terrific and really interesting post. 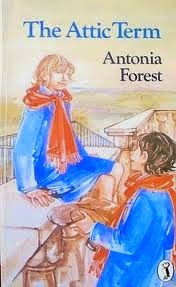 I loved those Antonia Forest books too, but I also loved the Chalet School - and was sad that I couldn't see myself in them. Most of the books I read when growing up weren't multicultural in anyway, and I would have liked them to be. I will buy your new one for my daughter. Also a very timely piece - and one which has a sentiment I agree with. Wasn't really aware of "looking for characters like me" when I read as a teenager, possibly because my favourite genres were fantasy and sci-fi and I used books for escapism. But a good blog. And we do need more diversity in children's/YA writing. One of the benefits of reading is that it makes you more tolerant of other cultures, increases your understanding and empathy so the more exposure to these, the better. I don't think I was very aware of Jewishness as an issue until I was in my early twenties, when I came across Chaim Potok's books and those of Isaac Bashevis Singer. Potok's books in particular I found absolutely engrossing, and very illuminating. But I never hear anyone mention them. Have you come across them, Keren and Miriam? But did you see kids like you in your school, on your street? Here's the thing about identification with characters in books: if you stand out from the people around you - if you celebrate Hanukah rather than Christmas; if your skin colour is darker; if your sexuality is different - then, as a child, you may feel excluded. A lack of diversity in books can serve to reaffirm this sense of isolation. But identification needn't be literal. The experiences of a character in a fantasy story who is lost in an unfamiliar land may resonate strongly with a child who feels out of place in their own world. Most of them looked like me, but they *weren't* like me. But isn't that the human condition? And if you are the only black/gay/Jewish/whatever child you have something to pin the difference on and everyone else doesn't, yet it's still there. If you are the clever child, the ginger child, the child with a hearing aid, the child whose parents are weird, the Baptist child, the vegetarian child (that's prob OK now), the child with too many freckles, the albino child, the haemophiliac child... you don't see others like you in real life or in books but books show you the things that are the same. Don't they? Perhaps some children feel they fit in. I can't imagine what their life would be like. your book sounds so interesting and sort of the opposite of an 'issues book' but I think its often more powerful when the issues are the background of characters' lives rather than the driver of the plot. You know, I've come across the idea of "seeing someone like me in books" before and never applied it to myself, but you're right. I didn't either. I read a lot of history and mythology and, later SF, but also pony books and of course, the heroines - and at least once during my childhood, hero - were white, middle-class and not Jewish. I say "of course" because kids like me didn't have the money or space for horses. I lived in a flat and dreamed of having a pony. I did read a few historical novels with Jewish themes - one about two Jewish siblings who escape the massacre at York and meet Robin Hood, another couple set in the time of King Solomon. That was about all and it still wasn't "seeing me". Nice post, Keren, thank you! I think the 'seeing people like me' thing matters far more to members of minority groups than to others, to be honest. Malorie Blackman has said 'I was very aware that I was not in the books I was reading. I still remember feeling I was totally invisible in the world of literature.' I felt not just invisible, but often portrayed in a distorted way. That's anti-Semitism and that's how I've been feeling in the last few weeks. Ah, Keren, only just seen your final comment after already posting my post for today - I came to the conclusion that negative portrayal is an additional and perhaps worse problem. What an honest and heartfelt post. Growing up in England, I never read books about kids like me and never expected to. But if I had, I'm sure it would have made me happy. In my writing, I always steered clear of stories about Jews, despite living in Israel. But perhaps it's significant that my first published novel is set in Jerusalem. It doesn't mention the conflict, but I think it gives a feeling of life here. I always loved the character of Miranda West, too, Keren. Of course the author was Jewish herself which maybe helped give her the confidence to write the character. I think part of the reason for the lack of diversity is that it's much harder to take the leap and write about a different ethnicity/religion from your own, for fear you'll be slated for getting it wrong. For example, Rainbow Rowell has been criticised for her portrayal of Korean Americans in "Elenaor and Park" - it seems to me unfairly, and I think that kind of reaction can make other writers nervous - I certainly feel that way. Maybe we just need to be braver!